Weslaco has the crucial experiences and highway system infrastructure – along with superior military, public safety, food distribution, and emergency response resources already in place, or soon to come online – making it the best choice to serve as the disaster relief headquarters for the Rio Grande Valley, Rep. Armando "Mando" Martínez, D-Weslaco, told fellow state lawmakers on Wednesday, April 8. In addition, the Mid Valley Airport in Weslaco is centrally located to serve all regions of deep South Texas, especially major coastal population centers – such as Brownsville, Port Isabel, South Padre Island, and Raymondville – which usually suffer the worst damages whenever hurricanes or powerful tropical storms hit the Valley. Weslaco’s legislative, city, and public safety leaders laid out their positions before the House Committee on Defense and Veterans Affairs, which held a public hearing early that morning on House Bill 848 by Martínez. HB 848 was left pending in committee – a normal procedure in the legislative process – for possible action later in the legislative session. "The Mid Valley Airport is the perfect location to house or coordinate emergency responses for the Valley," said Martínez, who, as a firefighter, licensed paramedic, and critical care flight paramedic, is an expert in life-and-death scenarios. "A major U.S. Border Patrol facility, a planned Department of Public Safety complex, and the Valley’s only Texas National Guard Armory are next to, or near, this airport. It makes sense to continue building on these resources by having the airport serve as the air transportation hub for major emergency actions taken by the state and federal governments during times of emergency." Those and other advantages of the Mid Valley Airport were highlighted by Weslaco’s top leadership despite public opposition registered by the Edinburg City Council, which favors a rival bill which is being carried by Rep. Aaron Peña, D-Edinburg. Peña’s bill substitute’s the words "South Texas International Airport at Edinburg" for Martínez’ "Mid Valley Airport" designation. Peña filed his HB 2152 several weeks after Martínez first filed HB 848. Martínez, who is also leading efforts to transform the University of Texas Regional Academic Health Center in Edinburg so it can provide the first two-years of a UT medical school, said the Edinburg airport has numerous other issues – and opportunities – that Edinburg city leaders should instead pursue. 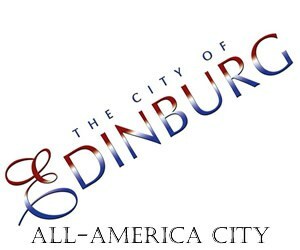 The Edinburg airport is 20 miles away from the U.S. Expressway 281/U.S. Expressway 83 interchange, and under ideal conditions, it would take at least 20 minutes to get emergency vehicles from the Edinburg airport to the crucial roadway intersection, and at least another hour to get to the Valley’s coastal populations, he said. Under the Edinburg City Council’s proposal, designating its airport as a staging ground for buses and heavy equipment would not be the best use of the state’s highway system, Martínez said. During an impending or actual catastrophe, such as the approach of a major hurricane, the key stretch of U.S. Expressway 281 which cuts through Edinburg and continues northward past the city’s airport would be much more important for mass evacuation purposes. 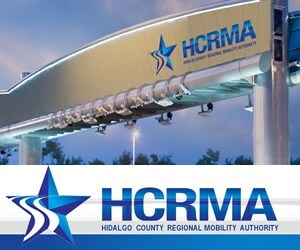 Martínez said the state would convert the three southbound lanes of U.S. Expressway 281 to northbound in order to help Valley residents escape in their vehicles, and any ground emergency resources located at the Edinburg airport would be hard-pressed to get to the population centers in Hidalgo and Starr counties. Martínez’ effort was endorsed by Weslaco Mayor Buddy de la Rosa, who was not able to attend the hearing because of other important business, but whose letter of support was entered into the public record before the House committee. In addition to serving as a command headquarters for the state’s military forces last summer during Hurricane Dolly, the Mid Valley Airport and the Super Armory were utilized by Texas in preparation for other major recent hurricanes which threatened the Valley or hit north of the region, including Hurricane Ike, which moved northward and devastated Galveston last summer, and Hurricane Brett, which caused havoc in Del Rio in 1999. Texas Task Force 1, according to Texas A&M University, is one of the most active search and rescue teams in the country, having responded to at least one major disaster each year since its inception in 1998. From the 9/11 World Trade Center attacks to Hurricane Katrina’s devastation, Texas Task Force 1’s urban search and rescue and water rescue teams have expertise in responding to both man-made and natural disasters. In addition to the public safety components, Martínez believes that allowing the Mid Valley Airport to take on the responsibilities of homeland security for the Valley would be an economic boost for the entire region. Edinburg, which has included in its legislative agenda an effort to have its city-owned airport also designated as a state headquarters for disaster relief, would be able to concentrate on its major mission of transforming the South Texas International Airport at Edinburg into a major air freight cargo distribution center, Martínez said. 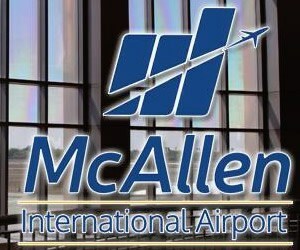 McAllen’s city-owned airport, McAllen/Miller International Airport, can focus on its efforts to increase commercial and private air passenger traffic. "From the Mid Valley Airport, we can get our emergency response resources quickly to any city in the Valley, especially to the coastal communities, which often get the hardest hit from tropical storms or hurricanes," Martínez said. "We are ready, willing, and able to serve as the disaster relief headquarters for our families, friends, and fellow citizens of this great region." Gov. Rick Perry on Wednesday, April 8, reiterated his request that lawmakers enhance Texas’ recovery efforts related to the 2008 hurricane season and its preparedness efforts for the upcoming season at the 2009 National Hurricane Conference, a nationwide forum for federal, state and local officials to exchange ideas and recommend new policies to improve emergency management. Atlantic hurricane season runs from June 1 to November 30. The governor spoke to an audience of more than 1,500 emergency management experts, including Max Mayfield, chairman of the National Hurricane Conference Planning Committee, and National Hurricane Center Director Bill Read. During the 2008 hurricane season, the Texas coast was battered by three hurricanes and a major tropical storm, resulting in the simultaneous designation of all Texas coastal counties as presidential disaster areas for the first time in the state’s history. As a result of Hurricane Ike alone, Texas sustained more than $50 billion in damages. In a phone call last month to U.S. Homeland Security Secretary Janet Napolitano, Perry discussed FEMA’s role in Texas’ continued recovery, as well as long term recovery goals for Hurricane Ike and future disasters. The governor has requested that FEMA extend the deadline for 100 percent federal reimbursement for debris removal for an additional six months, which would end October 26. He also requested that emergency protective measures be funded at 100 percent federal reimbursement beginning October 26, 2008, and continue for an additional 12 months. Additionally, last month the Governor’s Commission for Disaster Recovery and Renewal presented Perry with a preliminary report on how to better prepare communities for future disasters and help them recover quickly and completely once the storm has passed. The report is based on testimony given by citizens and local officials at a series of commission meetings held in Galveston, Harlingen, Beaumont and League City. For more information about Texas’ disaster recovery efforts, please visit: http://www.governor.state.tx.us. As one of the most historic accomplishments of his career, Sen. Eddie Lucio Jr., D-Brownsville, on Wednesday, April 8, gained unanimous approval by the Texas Senate for his bill that will create a medical school in South Texas. Sen. Juan "Chuy" Hinojosa, D-McAllen, and Sen. Judith Zaffirini, D-Laredo, are co-authors of the legislation. "I am elated, especially after the many years of hard work that we have put into making the dream of a full-fledged medical school a reality," said Lucio. "Senate Bill 98 spells great success in terms of medical education and expanded health care for the people of South Texas." SB 98 authorizes the University of Texas System Board of Regents to establish the University of Texas Health Science Center-South Texas consisting of a medical school and other health-related degree programs. "We have overcome numerous challenges and obstacles that culminated in this monumental feat – our own medical school serving the fast-growing and medically underserved South Texas border region," he added. "I can’t thank our South Texas officials and leaders, the medical community and the UT Health Science Center-San Antonio enough for their continued support through the years. And most of all, I commend Lt. Gov. David Dewhurst for the leadership he has provided in this endeavor and UT System Chancellor Dr. Francisco G. Cigarroa for his assistance." South Texas is ready for a medical school. In less than seven years, UTHSC-San Antonio’s Regional Academic Health Center has expanded here to provide clinical rotations for 600 third- and fourth-year medical students, many of whom have remained in the immediate area to practice, and 95 percent of whom have stayed in Texas. 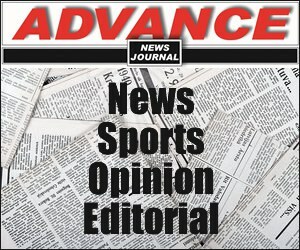 Citing a report by the Texas Higher Education Coordinating Board declaring that the Valley would be one of the most logical and feasible locations for a new medical school, Lucio said, "Finally, the state of Texas has responded to our loud cries that it is our turn for a medical school. Coordinating Board Commissioner Raymund A. Paredes, Ph.D. was instrumental in providing expert testimony attesting to the need for a medical school. I also thank my colleagues for their support, as well as the hundreds of business and civic leaders throughout South Texas whose dedication proved invaluable." Lucio envisions that the medical school would begin at the Harlingen RAHC, with facilities in any of the eight surrounding counties including Brooks, Cameron, Hidalgo, Jim Hogg, Kenedy, Kleberg, Starr, Willacy and Zapata. "Although we now await action on the House side, it certainly isn’t too early to consider the enormous impact that this bill will have on South Texas," added Lucio. "For example, we will be able to count on our own local residents to receive a complete medical education without having to leave home in the near future, and hopefully that they will also stay and practice among their South Texas families, neighbors and friends. From this point forward, we can begin to count on a school that will eventually train our own doctors and health care professionals right in our own backyard." U.S. Sen. Kay Bailey Hutchison, R-Texas, on Tuesday, April 7, participated in a groundbreaking ceremony for the Ambulatory Surgery and Specialty Outpatient Center at the VA Health Center in Harlingen. The new facility, coupled with service contracts for specialized care and emergency services, will dramatically enhance access to local medical care for Valley veterans. The VA reports that the services that will be available at the Ambulatory Surgery and Specialty Outpatient Center will eliminate 95 percent of travel for Valley veterans who are now driving to San Antonio for specialized care. “Today’s groundbreaking marks the first major step toward enhancing the level of care available to South Texas veterans. And this Health Care Center is only a down payment on a much larger debt that must still be paid – a hospital that serves the full needs of the growing population of South Texas veterans,” said Hutchison. “Two weeks ago, I met with the Veterans Alliance of the Rio Grande Valley. They made the trip to Washington, D.C to advocate for improvements in veterans’ care and make a personal plea for a hospital in the Valley. I salute them for their steadfast advocacy on behalf of veterans and future veterans,” she said. This expansion is the next phase of the plan to increase healthcare for veterans in the Valley. Slated for completion in December 2010, the center will increase current square footage from 38,000 to 158,000 square feet at the facility. The facility will offer a full range of outpatient services, including six surgical suites and clinics for prosthetics care, oncology, and sensory aids. Other services will include diagnostics such as digital X-rays, CT scans and MRIs, as well as outpatient surgeries, including cataract removals, diagnostic colonoscopies, and prostate biopsies. The addition will also add over 120,000 square feet of medical care space, making it the largest ambulatory care facility designed for rural veterans in the VA system. Additionally, in March, the VA announced that a contract was awarded to Valley Baptist Health Care System, which will provide the contracted care at its two medical center locations in Harlingen and Brownsville. Another contract was awarded to the South Texas Health System, where veterans will be able to access inpatient and emergency services at McAllen Medical Center and Edinburg Regional Medical Center. Services provided under the contracts will include acute medical, surgical, and mental health care in an inpatient setting, as well as emergency services. As the ranking member on the Senate Appropriations Subcommittee on Military Construction and Veterans Affairs, Hutchison has secured critical funding to expand medical care for Veterans in South Texas. Texas Attorney General Greg Abbott on Thursday, April 9, resolved the state’s probe into a Blue Cross Blue Shield of Texas’ (BCBS) physician rating program that used cost-based indicators to rank doctors. Under today’s Assurance of Voluntary Compliance, the health insurance company agreed to refrain from using its Risk Adjusted Cost Index (RACI) – to rate doctors as more or less affordable in providing quality medical treatments and achieving a desired health outcome for patients. The April 9 agreement also resolved investigation into Blue Cross’ handling of so-called out-of-network referrals. According to state investigators, Blue Cross threatened to terminate physicians solely on the basis of referring their patients for medically needed treatments from qualified specialists that were outside the Blue Cross provider network. Blue Cross cooperated with the state authorities and did not acknowledge any wrongdoing. "It is not appropriate to interfere with the protected doctor-patient relationship by terminating a doctor solely for making good faith out-of-network referrals for necessary care," said Abbott. Under Texas law, insurance providers cannot interfere with patients’ right to receive medical advice from their doctors. That legally protected advice includes treatment options, healthcare-related recommendations and physician referrals. Doctors have a right – and a duty – to inform patients about treatment options without interference from health insurance providers. 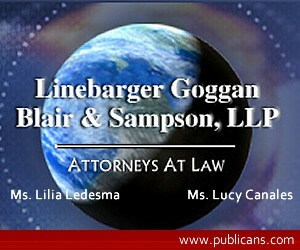 The law ensures that Texas patients have a legal right to their physicians’ best treatment advice. According to court documents filed by the state, BCBS’s RACI ratings were based on inaccurate information and flawed methodology. As a result, these ratings misled patients about their doctors and unfairly penalized physicians whose patients suffered from costly medical conditions. Under the agreement, BCBS agreed to stop publishing and using its RACI methodology to assign doctors’ ratings. The company also agreed not to terminate or threaten to terminate doctors for solely for making referrals for medically necessary care outside the BCBS network. The Senate Health and Human Services heard testimony on two bills on Tuesday, April 7, that seek to change the way the state deals with developmentally disabled individuals in its care. Sen. Judith Zaffirini, D-Laredo, the author of both bills, testified that although other states are moving away from physical restraints and drug controls of patients at state developmental centers, their use continues in Texas. She cited a recent Department of Justice investigation into state schools in Texas that found more than 10,000 instances of physical restraint applied to 751 residents in one year. "That is appalling," she said. The same report found, she said, that 78 percent of state school residents with maladaptive behaviors are given psychotropic drugs for treatment. Her bills would restrict the use of physical restraint and psychoactive drugs at Texas state developmental centers. Zaffirini’s first bill, SB 751, would prohibit the use of straightjackets or prone holds, where the person is held on the ground, in all cases. Other forms of physical restraint could only be used in cases where there is an imminent risk of serious injury to the resident or other residents. When a restraint is necessary, only the least restrictive form would be permitted. The Department of Aging and Disability Services would have to compile a report of each instance of physical restraint at state schools each month. The bill would also prohibit the use of psychotropic medication as a restraint method, unless specifically ordered by a judge or psychologist. The second bill, SB 750, deals with the use of psychotropic drugs at state schools. Zaffirini told the committee that too many state school residents are given medication when there is no reason to do so. "Many consumers receive medication with no diagnosis or without being identified as having a mental disorder not otherwise specified," she said. "The DOJ found that the quality of psychiatric diagnosis in Texas state schools falls far below professionally accepted standards." Under SB 750, developmentally disabled residents at state schools would be given the same right to refuse medication that other institutionalized citizens do. This could only be overridden in the case of a medication related emergency, or if the person’s legally authorized representative or a judge orders otherwise. When prescribing medication to a state school resident, a physician would have to provide to the person or the person giving consent for the medication information about the condition to be treated, any possible risk or benefit to the medicine, as well as any accepted alternative treatments for the condition. Physicians could apply for a court order to administer the medication in situations where they deemed it necessary. Then if the court decides that the resident lacks mental capacity, and the medication is in the person’s best interest, then the medication could be administered against a resident’s wishes. The South Texas Transplant Center at McAllen Medical Center on Tuesday, April 7, held a public flag raising ceremony as part of “Flags Across America", a Donate Life America initiative which honors and celebrates the hundreds of thousands of donors and recipients whose lives have been affected by organ, eye and tissue donation. Guest speakers included Joe Riley, McAllen Medical Center’s Chief Executive Officer, Eli Cortéz, the South Texas Transplant Center’s first kidney transplant patient, Yolanda Montemayor, the Southern Region Manager for the Texas Organ Sharing Alliance, Charles Mortiz, MD, Transplant Nephrologist and Medical Director for the South Texas Transplant Center and Robert Tamez, Assistant Administrator for McAllen Medical Center. 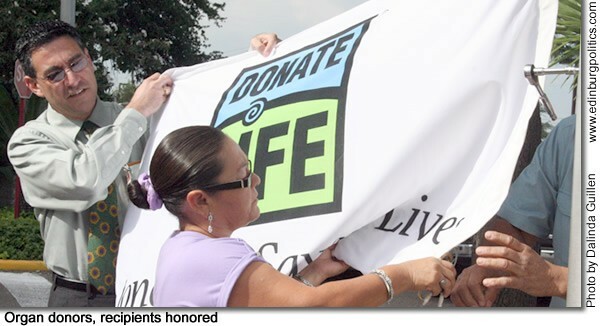 The Donate Life flag was officially raised by Micaela Ledezma, who after six years on dialysis, received a kidney from a cadaver and underwent a transplant procedure at the South Texas Transplant Center at McAllen Medical Center. With a healthy kidney, Ledezma has been able to live her life without dialysis. The South Texas Transplant Center is the first and only comprehensive transplant service center in the Rio Grande Valley. Its physicians – Daniel "Rick" McLean, M.D., Medical Director and Transplant Surgeon, Charles E. Moritz, M.D., Medical Director and Transplant Nephrologist, and José Farias-Jiménez, M.D, Transplant Surgeon – collaborate with a multidisciplinary team of medical professionals to provide donor patients with the highest quality of care possible – both before and after transplantation. The team has successfully preformed 35 kidney transplant procedures since the center’s opening in 2007. Edinburg Regional Medical Center and McAllen Heart Hospital joined McAllen Medical Center on April 7th by flying Donate Flags at their facilities in observance of Donate Life Month in April. To learn how to register as an organ, eye and tissue donor, visit http://www.donatelife.net. Founded in 1992, Donate Life America’s mission is to serve as a national voice and inspire all people to save and enhance lives through organ, eye and tissue donation. The South Texas Transplant Center in McAllen opened in 2007 to provide the Rio Grande Valley’s first renal transplant services south of San Antonio. Since the center’s opening, 35 kidney transplant procedures have been performed and hundreds of individuals screened for donation. The South Texas Transplant Center also has a clinic in Harlingen, Texas. 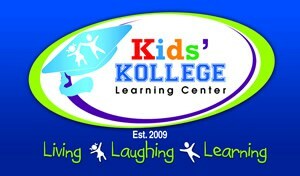 For more information visit http://www.southtexashealthsystem.com. Texas could soon have no money to build new roads if the Legislature doesn’t take action to find new sources of funding, according to warnings from members of the Senate Transportation and Homeland Security Committee. Committee members gathered Wednesday, April 8, to highlight the risk they believe the state transportation system faces. "The course we’re on will result in no new roads in Texas in the very near future," said Committee Chairman Sen. John Corona, R-Dallas, the chairman of the Senate panel. He and his colleagues fear that state money for new roads could dry up as early as 2012. The problem, according to committee vice-chair and Sen. Kirk Watson, D-Austin, has three main causes. The first is the fact that the state gas tax, which is a major source of new transportation dollars, has not been raised since 1991, in spite of rising construction and maintenance costs. The second cause is diversion from the state’s highway fund to pay for other state programs. The final cause, said Watson, is too much debt. "We are literally papering over the problem of not having sufficient funds by resorting to borrowed money and soon that’s going to catch up with us," he said. "Frankly, it’s just not sustainable and it leaves our future at risk." A Texas Department of Transportation study during the interim looked at the potential shortfall of transportation funding in Texas through the next decades. The balance of Fund 6, the state highway funding source, has decreased from $3.74 billion in 2004 down to $2.5 billion today. By 2012, that number is projected to drop to about $1.7 billion. "The money in the system is just enough to maintain what we have," said committee member Senator Eliot Shapleigh of El Paso. "If we don’t provide the revenue options in this session, we will head in that direction by 2012." Annualized though 2030, that leaves Texas with about an $8 billion annual shortfall in transportation funding. Later on April 8, the Senate gave tentative approval to one plan that Carona believes will alleviate the strain on state transportation funding. SB 855, by Carona, would create local options to fund local transportation projects without turning to toll roads or new debt. The bill would permit a local government body to hold an election, at which voters could decide to raise or create certain fees to pay for transportation projects, from new highways to commuter rail, in the region. These fees include small increases to the gas tax, increasing vehicle registration fees or fees on emissions. During the election, the ballots must list each proposed project the fee increases will pay for, how much the project costs and when it will be completed, as well as when fee increases will expire. A final vote on the measure is expected on Tuesday, April 14. Also on April 8, the Senate passed a bill intended to continue improving air quality in Texas. While bill author Sen. Kip Averitt, R-Waco, says the state has made "almost miraculous" progress in cleaning up the state’s air, more can be done. His bill would bring together four agencies closely related to air quality control in Texas: the state comptroller, Texas Commission on Environmental Quality, the Public Utilities Commission and the Railroad Commission. These agencies would collectively develop strategies to decrease emissions in Texas. The bill would also create a number of incentive programs to encourage the purchase or development of greener technologies, from plug-in hybrid vehicles to more efficient appliances and equipment for businesses. An important component of the bill, said Averitt, is a measure that directs representatives of the four agencies to be active participants in federal negotiations relating to greenhouse emissions. "If and when the feds decide to adopt climate change related regulations," he said, "we want to be in a proactive position, because we have more to lose in that situation than any other state in the Union." The bill now heads to the House for further consideration. The U.S. Housing and Urban Development Department has awarded Hidalgo County a grant for $3.4 million to help families and individuals that are currently at risk of becoming homeless, and those who are experiencing homelessness and need assistance to obtain housing. The funds, which will be administered through the county’s Urban County Program, aim to prevent homelessness. A public hearing on the Homelessness Prevention and Rapid Re-housing Program (HPRP) action plan will be held on Thursday, April 16, 2009 at 5:30 PM at the county’s Urban County Program office located at 1916 Tesoro Boulevard in Pharr. • 2009 Recovery Act Capital Fund Formula: $127,056.00. 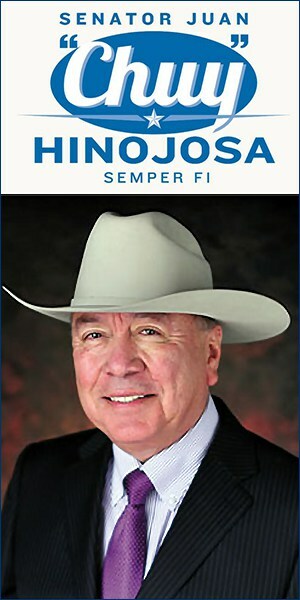 Congressman Rubén Hinojosa, D-Mercedes, on Thursday, April 9, announced that $372,286 has been awarded to Deep South Texas by the Emergency Food and Shelter Program (EFSP). Federal funds totaling $100 million were made available to the EFSP, through the American Recovery and Reinvestment Act of 2009 (ARRA), to bring immediate relief to communities to address unemployment, poverty and other needs in light of the economic climate faced by our country. 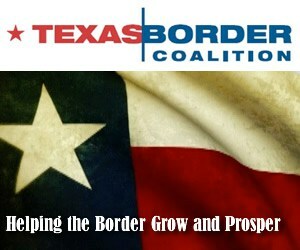 Additional jurisdictions in South Texas may be selected at a later date by the EFSP State Set-Aside Committee. The EFSP National Board, chaired by the Department of Homeland Security’s Federal Emergency Management Agency (FEMA) and composed of representatives from American Red Cross; Catholic Charities, USA; United Jewish Communities; National Council of the Churches of Christ in the U.S.A.; The Salvation Army; and United Way of America, provides supplemental funding to shelters, soup kitchens, and food banks. One-month awards for rent, mortgage, and utility assistance are also available. The funds are used to help individuals and families with non-disaster, temporary emergency needs. In each funded jurisdiction, a Local Board advertises the availability of the funds, establishes local priorities, selects local non-profit and government agencies to receive supplemental funding, and monitors program compliance. The Local Board’s composition mirrors the EFSP National Board, with a local government official replacing FEMA and board members voting to select their chair. The EFSP has been in existence since 1983 and was authorized under the McKinney-Vento Homeless Assistance Act of 1987. With the ARRA funding, more than $3.404 billion in federal aid will have been disbursed through the EFSP since its inception to communities nationwide, and has accounted for millions of additional meals and nights of shelter to the hungry and homeless most in need across the nation. A state-by-state list of the eligible jurisdictions and award amounts is available at http://www.efsp.unitedway.org . Gov. Rick Perry on Thursday, April 9, joined Rep. Brandon Creighton, R-Conroe, and sponsors of House Concurrent Resolution (HCR) 50 in support of states’ rights under the 10th Amendment to the U.S. Constitution. 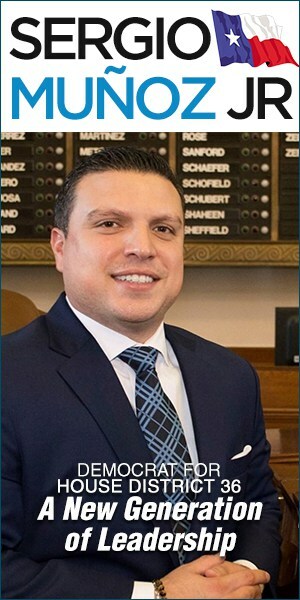 Rep. Ryan Guillen, D-Rio Grande City, is a joint author of the legislation. Rep. Aaron Peña, D-Edinburg and Rep. Eddie Lucio, III, D-San Benito, are co-authors of the bill. A Mission man was sentenced to prison on Thursday, April 9, for bank fraud and theft by bank employee, according to acting United States Attorney Tim Johnson. Erik Alfredo Constante, 22, of Mission, was convicted by a federal jury on July 9, 2008, for bank fraud and theft, embezzlement or misapplication by bank officer or employee. On April 9, U.S. District Court judge Randy Crane sentenced Constante to 36 months in federal prison followed by five years of supervised release. The investigation leading to these charges showed that Constante forged the signature of an International Bank of Commerce customer on a debit slip and used the forged document to withdraw approximately $100,000 from the bank customer’s account. Other evidence at trial showed that Constante then handed over the money to an unknown co-conspirator. Constante testified at trial and claimed that “the Zetas” threatened him to steal the money and that he did so out of fear that his family would be harmed. Constante further admitted he never informed law enforcement about the threat. Lastly, evidence at trial showed that when Constante was asked about the $100,000 cash transaction by bank officers, Constante claimed he could not remember performing the large cash withdrawal. After a two-day trial, a jury returned a guilty verdict on both counts in the indictment. The investigation was conducted by the United States Secret Service Special Agent Cameron Wolfley and was prosecuted by Assistant United States Attorneys Robert Wells Jr. and Patricia Ann Rigney. Acting Assistant Attorney General for Civil Rights Loretta King and Acting U.S. Attorney for the Southern District of Texas Tim Johnson on Wednesday, April 8, announced the arrest of a former trooper with the Texas Department of Public Safety who is charged with depriving multiple Latino motorists of their civil rights. According to the four count indictment returned by a federal grand jury in Corpus Christi on April 8, Michael Anthony Higgins violated federal law by willfully stealing money from Latino motorists that he had stopped on the highway while working as a trooper. If convicted, Higgins faces a maximum sentence of up to four years in prison, restitution and a $400,000 fine. An indictment is merely an accusation, and a defendant is presumed innocent unless and until proven guilty. The case was investigated by the FBI, the Texas Rangers, and Officers of the Texas Department of Public Safety. The case is being prosecuted by Rubén Pérez of the U.S. Attorney’s Office for the Southern District of Texas and Jim Felte from the Civil Rights Division. Dr. Bin Fu, assistant professor in Department of Computer Science at The University of Texas-Pan American, has become the second faculty member on the Edinburg campus to receive the National Science Foundation’s most prestigious honor, the Faculty Early Career Development (CAREER) Award. The NSF accolade is presented to junior faculty members at CAREER-eligible organizations who exemplify the role of teacher-scholars through outstanding research, excellent education and the integration of education and research within the context of the mission of their organizations. Dr. Karen Lozano, mechanical engineering associate professor who holds the Julia Beecherl Professorship in Engineering at UTPA, won the honor in 2001. Fu’s winning CAREER proposal titled “CAREER: Theories and Applications of Efficient Separator and Randomization” was awarded $409,157 in funds for a five-year period starting April 1, 2009 through March 31, 2014. “Now that my research plan has been recognized by the National Science Foundation I feel more confident about what I would like to pursue in both research and education. I am also very grateful to many of my UTPA colleagues for their selfless help to let me get where I am,” Fu said. According to the National Center for Biotechnology Information, bioinformatics is the merging of biology, computer science, and information technology into one field and can be used in the exploration of genetic diseases or the development of new drugs. DNA and protein sequences are mapped and analyzed through bioinformatics. 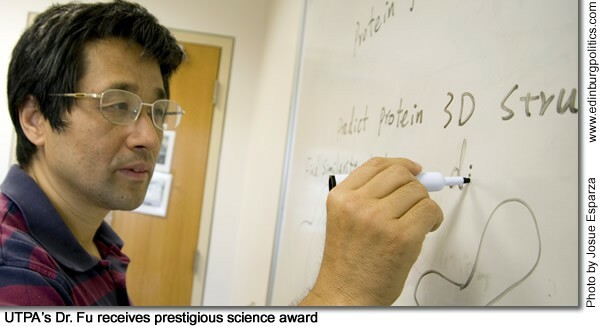 Computer programs are used to make inferences from the data archives of molecular biology to make connections among them, and to derive useful and interesting predictions Fu said. “A separator is a basic computational tool that decomposes a large problem into smaller and smaller problems. Therefore, creating efficient computer algorithms and software,” Fu said. “Our society is facing a lot of challenging computational problems and one of the most challenging is the protein folding problem, which asks to determine a protein 3D structure from its amino sequence. This is where the width bounded separator theory originated from for me. The research of 3D protein structures has significant applications in drug design." "It is a really wonderful experience for me to see the interaction between life science and information science," he added. Originally from China, Fu joined the UTPA faculty in August 2006. 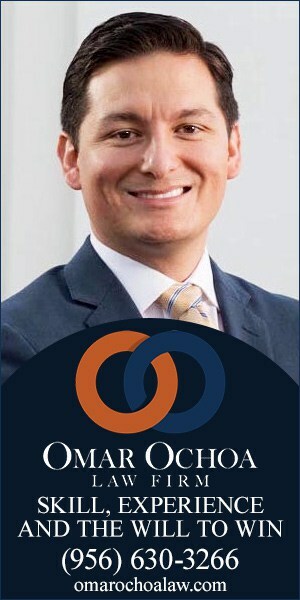 He previously worked at the University of New Orleans for three and a half years as an assistant professor and for five years served as a lecturer at the Beijing Computer Institute. 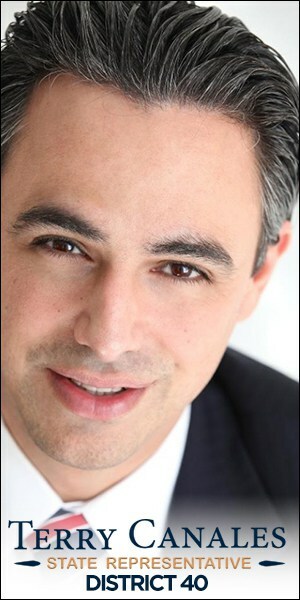 He received his Ph.D. in computer science from Yale University in 1998 and also studied at Princeton University for a brief time. Fu earned his Master and Bachelor of Science in computer science from Wuhan University in Wuhan, P.R.China. Fu’s area of expertise in the areas of computer science includes bioinformatics (protein folding), algorithms (width-bounded separator theory, Rocchio’s relevance feedback algorithm analysis, and Abelian group factorization), complexity theory, and molecular computing. With the NSF grant, Fu said he plans to support two graduate student researchers to assist with the research and later fund undergraduate research students. “It is very important that UTPA students join this research, which has both theoretical development and software simulation,” Fu said. “Students involved in this research will develop the computational algorithms and software in protein structure analysis, which includes the structure comparison and prediction." Fu said he currently has a productive group who has successfully set up a cluster of computers to provide a bioinformatics Web service designed as a tool to compare protein 3D structures. A user of the site can input structures by either Protein Data Bank (PDB) codes or by uploading PDB format files from a local computer. 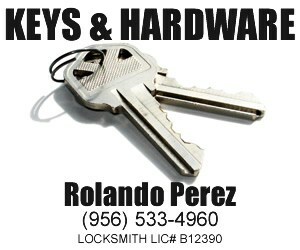 His Web service is open for public access via his UTPA Web site at http://fpsa.cs.panam.edu/. Dr. Wendy Lawrence-Fowler, UTPA vice provost for research and sponsored projects, said Fu’s CAREER Award for his research at UTPA exhibits the caliber of faculty on the campus, which is on a mission to become the premier learner-centered research institution in Texas. “Dr. Fu has made significant contributions to the field of computer science and his receipt of this award speaks to the quality of faculty in the School of Engineering and Computer Science,” Lawrence-Fowler said. 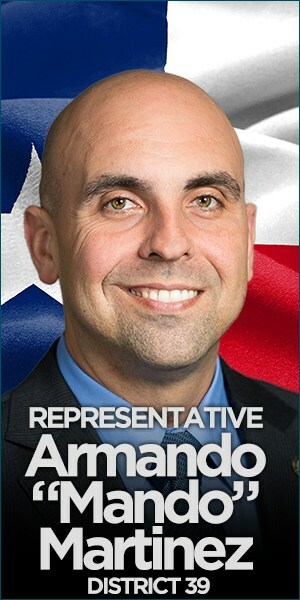 House Resolution 689, authored by Rep. Armando "Mando" Martinez, D-Weslaco, and honoring the history and contributions of several Hidalgo County communities, was recently adopted by the House of Representatives. 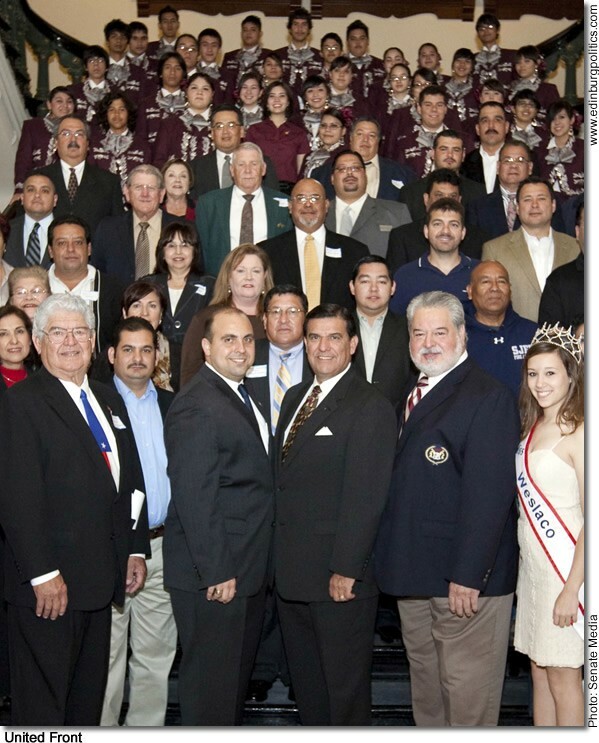 RESOLVED, That the House of Representatives of the 81st Texas Legislature hereby recognize March 11, 2009, as Mid-Valley Day at the State Capitol and extend to the visiting delegation best wishes for an informative and enjoyable stay in Austin.